This is not a good week to be a supporter of the Scottish National Party or its two-faced leader. She and her party, turned, turned and turned again over whether to vote on the Tories’ forthcoming vote on repealing the fox hunting ban. Does anybody know what the SNP’s current position is? Will MPs vote, despite it being an issue that doesn’t affect Scotland, or will they abstain – despite the fact that this makes them worse than the Labour Party the SNP pilloried for abstaining from votes that were much less important in comparison? Last Friday we discovered that the Cabinet Office had ruled that a memo, suggesting she had lied about wanting to support a minority Labour government led by Ed Miliband – because he’s not “prime minister material” – and would prefer David Cameron to continue, was not a fake but was real, and the civil servant who wrote it believed the information in it to be correct (although he did express reservations as to whether his informant had correctly understood what she was saying). Yesterday (Tuesday), she U-turned again – this time on her claim that the Charter for Budget Responsibility, which Labour supported, would require that party to support £30 billion of government spending cuts during the 2015-20 Parliament. This blog made it perfectly clear that the Charter itself requires no such thing – and, now that Labour has been defeated, it seems Ms Sturgeon feels the coast is clear enough for her to admit the same. Clearly, young Nicola owes the Labour Party – and former Shadow Chancellor (now ex-MP) Ed Balls – a rather hefty apology. Of course, this doesn’t just show that Sturgeon was lying when she lambasted Labour for showing the same support for the same Charter that she’s showing now. It shows that she was lying when she claimed the SNP would support a minority Labour government. She and her party did everything they could to ensure that such a government would never be elected – in this case, casting doubt on its financial reliability. And that, of course, makes it all the more likely that she really did say she wanted Cameron to continue as Prime Minister, in that oh-so-hotly-disputed conversation with the French ambassador. The SNP’s most ardent members and supporters will never admit this, of course. They hate any criticism (as has – again – been noted by this blog; read the article and the comments) and refuse to pay any attention to rational arguments. But the evidence is clear for everybody else. It seems the Tories have another set of 56 new allies in the House of Commons. Perhaps the “voters” will show their distaste for the SNP in forthcoming elections? ?..Unless,like the general election the SNP thugs are pulled out of the bottom draw to bully voters yet again.? Good grief. I’m floored. Maybe she, and many others, should resign fire making less almost as big as Ian Carmichael. Could you clarify your final sentence, please? It seems to stop making sense after “resign”. Get over it Mike. You seem to be a sore loser. Why not hammer away at the Tories while “Labour” wallow around and dreadful post-Blair clones try to put their hats in the ring. Isn’t it a shame that the SNP supporter’s only response, when his party comes under fire, is “Look at how badly Labour is doing”? It seems they are the sore losers here. Thanks for hitting the Tartan Tories yet again where it hurts, Mike – in the truth. Is this a comedy section? or a Carmichael special events! if you really want an answer to a question,then ask it (the question) and listen to the complete unabridged answer,otherwise you just become a laughing stock,sorry I should put just become the laughing stock for longer than usual.Its as usual a great week any week is,to be a supporter of the Scottish National Party,and to be a member is so wonderful,aye I’ve been a member for some time now first joined in the 1970,s moved away and had to rejoin everytime I moved like going to Australia then coming home rejoined and still a member such a wonderful feeling,not being cowed nor conned seeing through the Westminster Party’s lies and liars,I say Westminster party as I consider The Conservatives,Labour and the Lib-Dems to be the one party just different divisions.The Labour party left the people the day it sent Labour members to the house of lords,that same house they had promised to dissolve,but I guess greed got to them,so they just joined “The Establishment” and became like all the rest.All the attacks on the SNP come from fear,fear of losing the cash cow called Scotland,and Labour arm of TWP,still think it can win back votes here,I don’t believe they can. The fact here is that we’re not going to get the answer (if the question is, was Nicola Sturgeon lying about saying what’s attributed to her in that famous memo). She says one thing, the memo says another – and there is good reason to suggest that the “lost in translation” comment is a diplomatic “get out” for the French Ambassador and Consul General. I know that’s not what you want to read, but then your claim that the SNP is having a great week provided much-welcomed comic relief here. Scotland isn’t a cash cow, by the way; it costs more than it makes. I’ve got a graph here to that effect and will try to dig it out and reproduced it below. Do you have the matching graph for England/Wales Mike? The Scots pay more tax per head than the rUK average but I’m not so sure about the rest of the revenue. I don’t. This was only produced to demonstrate that the claims about Scotland costing less than it makes simply isn’t true. If what the Cabinet Office says is true about the memo not being a fake, it seems that BOTH Sturgeon and the French Ambassabor are liars – as is Alistair Carmichael for writing “details of that account are not correct in his apology letter to Sturgeon. It would be more accurate to say that the possibility should not be ruled out. There is certainly room for more than one interpretation. Getting a bit rough, is it? You SNP types always start going on about “sour grapes” when you’ve been caught out. Mike the whole of the UK is run on a deficit. The point is Scotland contributes a bigger percentage of GDP than it gets back. We also pay interest on a debt that the UK borrows on our behalf that isn’t spent on Scotland. Showing a graph for only Scotland is misleading (which I’m sure is your intention). 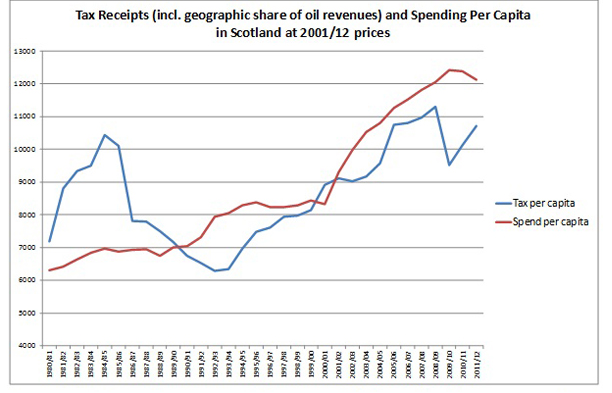 The point of the graph, and other information (if I recall correctly), is that Scotland doesn’t. It gets more back than it contributes. As does England, as does Wales, as does NI. The point that was made is that the entire UK is in deficit, but that Scotland’s deficit per capita is lower than the UK as a whole because Scotland pays a higher amount per capita than the UK as a whole. No-one comes out of it paying in less than they get out because the money we’re all living on at the moment is borrowed money and the overall debt mountain keeps getting higher. That is not the point that was made; or if it was originally, then many SNP fans have gleefully perverted it. Scottish nationalists have been perverting facts for a considerable amount of time now – certainly since before the referendum last year. I beg your pardon, there’s no-one paying in more than they get out because of the borrowing level. The claim is still that Scotland puts in more; it’s false. At 9.30pm it states: Sturgeon says this is a manufactured argument. Labour and the Tories both voted for £30bn more cuts. To Murphy, she says he talks the language of ending austerity, but votes for more facts. Reported speech but the best I could find quickly. I always thought the SNP would implode under its own Hubris and Lies. Didn’t think the process would start so soon.